Our team is specifically trained to diagnose, treat, and manage car accident related injuries to get you better faster. Our facility is conveniently located and is considered an all in one clinic for the treatment of car accident injuries. We have 4 chiropractors, 2 massage therapists, a physical therapist, physical therapy assistant, medical doctor, physician assistant, acupuncture, and 3 medical assistants that all assist in your care for a quicker recovery. The facility features a digital x-ray suite that we utilize to perform car accident specific x-ray views, which differentiates us from other clinics and imaging facilities. Not only do we have a multidisciplinary team, but use sophisticated approaches in your diagnosis and treatment. Auto accident related injuries usually respond the best with a team approach. Our professionals offer a variety of therapies, rather than only getting adjusted or only getting massage for your injuries, we offer a comprehensive well rounded treatment plan. 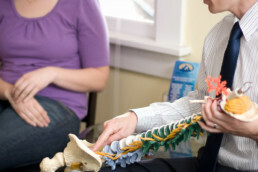 It is this multidisciplinary approach that differentiates our clinic from other chiropractic clinics in Denver. Our all in one clinic approach also helps protect your medico-legal situation as the at fault insurer typically likes to nit pick “chiropractic only” care. At fault insurers have a poor track record when it comes to giving just settlements to the injured parties. Most of large auto insurance carriers have been sued for bad faith and that is usually why people need attorneys for the auto injuries they’ve sustained, especially when the injury creates permanent problems. Not auto injury cases need attorneys, but when they do it is important that you choose a clinic that is aware an accustomed to dealing with theses particulars. Your case also depends on timely treatment and most importantly it favors betters outcomes with your healing progress. Waiting weeks or months, or even years is the worst thing you could do to facilitate the healing process of automobile injuries. Early intervention is paramount to getting the best results. Don’t make the mistake that your pains will go away, because more often than not, your pain will stay the same or get worse. Whiplash injuries also have a knack for popping up later, this is due to spinal ligaments being damaged which creates an unstable spine that slowly manifests into other injuries. Getting assessed is key to protecting your well being. If you’ve been injured in a car accident in Denver, we can help you. Call us at 303-455-2225 for an immediate consultation and examination of your injuries. This can be tricky for the car accident victim. Your first step is to call your own auto insurance company and ask if your policy has med-pay on it. By default, your auto insurance has $5,000 to cover medical expenses related to your auto injuries. Some insurance companies will suggest you waive this coverage, but you have to do this in writing when you first acquire your auto insurance policy. Some auto insurance carriers will offer as much as $100,000 in med pay benefits. Check with your auto insurance carrier first to see if you have med-pay. If you don’t have med pay on your policy, and the car accident was caused by the other driver, then you must speak with the other insurance company. Hopefully, the person that caused that accident has insurance. If they don’t have insurance, then hopefully your policy has uninsured motorist coverage. If they do have insurance, they will pay for your care up to a reasonable limit. Essentially you have to find a provider that will treat you on a lien, such as our clinic. The other persons insurance will only pay after treatment is complete. In this scenario, you may need a Denver personal injury attorney to help represent you to get your medical bills paid in full. The most important aspect of whiplash treatment in Denver is to get seen as soon as possible, regardless of who is at fault. Our clinic offers many different treatment options including cold laser therapy, dry needling, kinesio taping, active release technique and more. Contact our office or request an appointment today if you are experiencing whiplash pain.